Halloween is here. I wish it was a trick to tell you that the red marks are back with a vengeance. The large circular spots fighting continue to fight their way out. Flesh color inserts can be alarming to us, yet Kelsey seems to be keep on smiling. Without a true understanding, we continue to feel perplexed and question the right next steps. Two new medications have not seemed to bring change. What is next? What is right? What is going on inside this tiny little body? We are almost numb to the marks… almost. At the very least, we try to be to keep calm and steady for Kelsey. Cool weather have kept them hidden from view to most, and we are grateful for long sleeves and leggings. With the thrill of Halloween and movie options out, we began a dialogue regarding movie genres. Most adults like a little thrill, and some kids do too. In conversation, it was clear that though certain genres interest some, sometimes reality is scary enough. This Halloween, we hope for all treats. To enjoy a night with the Amazing Kreskin in support of Kelsey’s Kaleidoscope, treat yourself to our third annual gala. Lately, we’ve been trying to find ways to be happier and savor our family time together. Today, one family member sat in the hospital after a terrible accident and one patient who suffers with Kelsey’s disease awaits amputation. Today, instead of finding ways to be happier, we embrace gratitude and pray for one of our biggest supporters to come home safely and one of the first diagnosed patients to count his blessings with less toes than yesterday. Help support our cause at our third annual gala with the Amazing Kreskin. 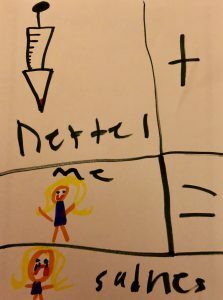 When we find drawings under our daughter’s bed on a random Thursday, we do not know what to do except be honest, talk through the worry, and understand that though it is a weekly reminder for our family, it is a constant worry for the one who endures. Wednesday worries always get us. Screaming a special word and enjoying a treat following have become routine. Our fur baby typically stays away because we felt that best for all. Kelsey took her spot as we prepared all necessary items. Our pup whimpered and stood by her side. Guard dog sensed it was time and continued to whimper. She pet him and told him it would be alright. He would not leave her leg or her side. When I made my way over, he stared at me and then took my typical spot, whimpering and crying a bit as he did. Was he reading our minds? The duration of the injection and prep was met with his cries of woe. We all marveled at how we leave him out of the routine, and today, it was clear he wants to be at Kelsey’s side and involved in the routine. ”Lukey is my true spirit animal,” Kelsey said. The weeks and the lesions have been tough on Kels. The more she learns, the less she understands. The less she understands, the more questions she asks. Those conversations take an emotional toll on us all, even with our overall positive outlook. Kels had her first friend sleepover this past weekend, and she has been talking about its splendor for days, too. Tonight she thoughtfully stated that even though she loves her room, being in another room helped her forget about her needle and her disease. Though no good amounts to most sleepovers, this one yielded huge positives for Kels.